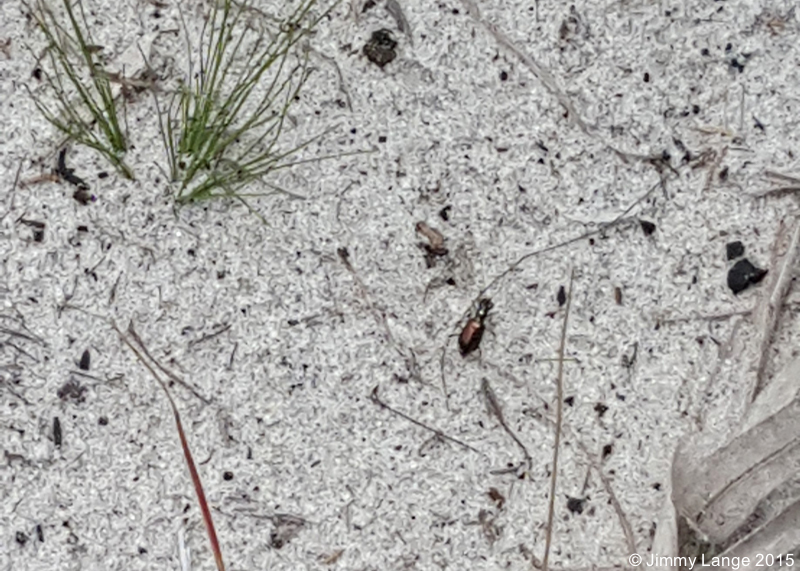 Today the Center for Biological Diversity filed emergency petitions to protect the exceedingly rare Miami tiger beetle, Cicindela floridana, a South Florida pine rocklands endemic, as a protected species under Florida law and as endangered under the federal Endangered Species Act. 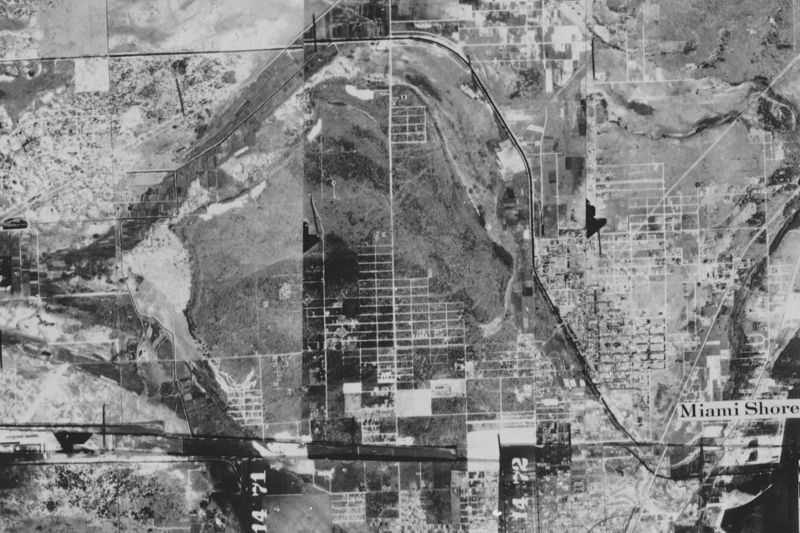 Pine rocklands once stretched from the Florida Keys up to the northern edge of Miami-Dade County, but widespread urbanization and agricultural development destroyed the majority of Floridian pine rockland. This fire-dependent community, found on limestone outcroppings, is comprised of a sparse canopy dominated by Florida slash pine, Pinus elliotti var. densa, and a varied understory. Today, only a fraction of the original Miami pine rockland habitat remains; by some estimates as little as 1.8%. Moreover, most of these remaining areas are quite small and often widely separated by miles of heavy development. The pine rockland habitats are home to many endemic species, many of which are listed as endangered including the Florida Bonneted bat (Eumops floridanus), Bartram’s hairstreak (Strymon acis bartrami), Florida leafwing (Anaea troglodyta floridalis), Florida brickell-bush (Brickellia mosieri), deltoid spurge (Chamaesyce deltoidea deltoidea), Carter’s small-flowered flax (Linum carteri carteri), tiny polygala (Polygala smallii). Today many of these remaining pine rocklands and their inhabitants now face another danger; due to the lack of fire, both native and non-native vegetation are taking over the habitats which incrementally transitioning to hardwood hammocks. 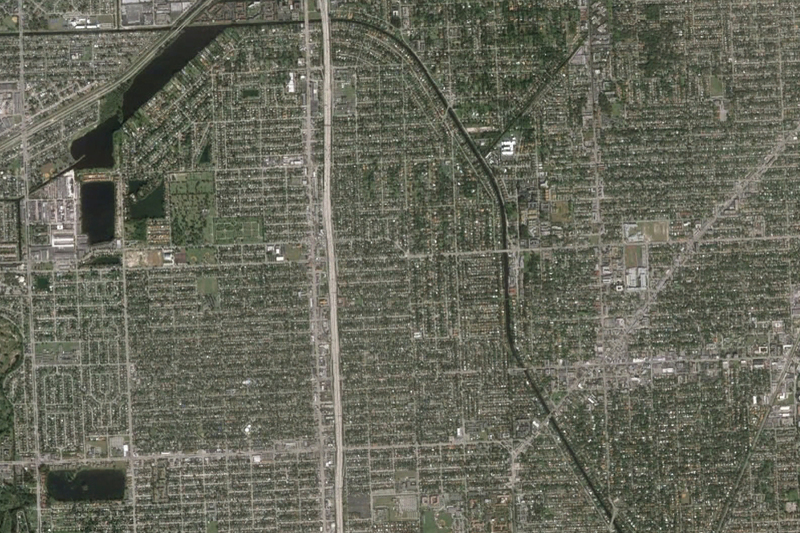 Of greatest concern is the Richmond Heights pine rocklands, where the Miami tiger beetle was rediscovered in 2007. In addition to vegetation encroachment, there are plans to develop significant portions of the pinelands. The first, and most immediate, is Ram Realty’s plan to develop and 88-acre parcel of rocklands purchased from the University of Miami. While Ram has set aside some of the land for nature preserves, any development seriously jeopardizes the rocklands by fragmenting the remaining habitat and stifling fires, a necessity for the continued health of the habitats. The second, and most expansive in scope, is the county’s plan to develop a major amusement park in and around the rocklands. This plan calls for major development including a four lane highway and major transportation corridor through the rocklands. This development will irrevocably damage all of the Richmond pine rocklands, through fragmentation, pollution, and stifling fires within the remaining habitat. Both development pose real and immediate risks to endangered and rare species, including the Miami tiger beetle. These developments will results in the destruction and degradation of pine rocklands and will kill endangered and candidate species including the adults and larvae of the Miami tiger beetle. 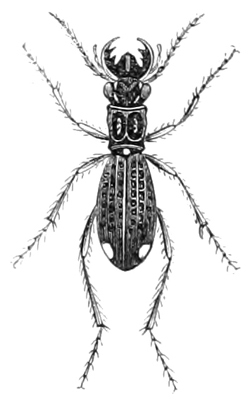 Even before the current plans for development the Miami tiger beetle (Cicindela floridana) was a U.S. Fish and Wildlife Service species of concern. Additionally, Knisley et al (2014) assigned the Miami tiger beetle a 1+ grade, their “highest level of rarity and/or threats” in a comprehensive review of the conservation status of United States tiger beetles. With over 98% of the potential former habitat gone and direct threats to the only remaining habitat this species is in need of urgent action to prevent its extinction. The Center for Biological Diversity’s press release is available at their website. 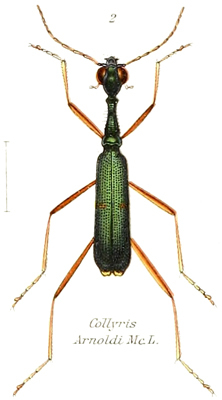 Readers of this blog may be familiar with the story of Cicindela floridana, a beautifully iridescent tiger beetle presumed extinct but rediscovered in 2007. This beetle is only known from pine rocklands, a habitat once common in southern Florida but only 1.8% of the original rocklands remain today (outside of the Everglades National Park). The exact type locality for var. floridana is problematic. Cartwright (1939) gives the locality as Miami, Florida based on Young’s label. In the 1980s, R. L. Huber, in an attempt to locate this form contacted Young who told him the specimens were collected in the vicinity of Gratigny Road while he was studying land snails in the sandy hammocks. …. Knisley also contacted Young in the early 1990s and learned that the specimens were taken in the vicinity of Barry [University]. 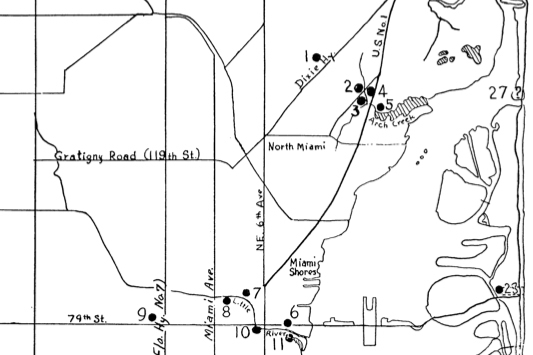 My curiosity piqued, I combed through Frank Young’s publications and found a 1951 paper “Vanishing and extinct colonies of tree snails, Liguus fasciatus, in the vicinity of Miami, Florida.” In this paper Young includes a map of his study sites, which are tantalizingly close to Gratigny Road and Barry University (located south of Gratigny St. and Miami Ave). If there is a connection between Young’s early snail hunting and this 1951 paper and we might be able to pinpoint the type locality of C. floridana. The distribution of the hammocks around Arch Creek shows the same general pattern as those around New River to the north or Little River to the south. That is, the hammocks occur along the margins of the stream or its estuary, across the rocklands of the East Coast ridge, and fan out along the edges of the transverse glade. This pattern is apparently maintained by the nature of the soils and the periodic fires which sweep the bordering rocky pinelands and encroach upon the edges of the hammocks. This paper suggests that the area around Gratigny Road and Barry University may have been pine rocklands and substantially narrows the potential area in which Young may have collected the type series in 1934. 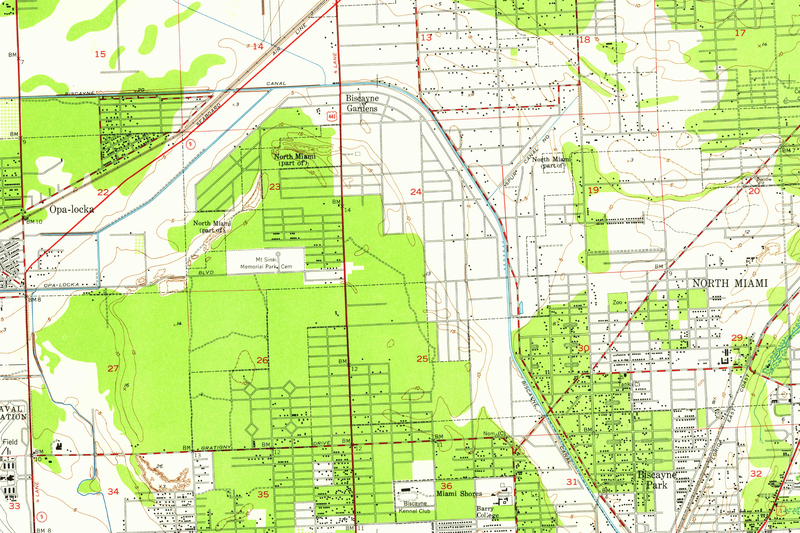 In this 1947 topographic map you can see that the area around (and north of) Gratigny Road and Barry University is slightly elevated from the surrounding, consistent with (but not necessarily indicative of) pine rocklands habitat. 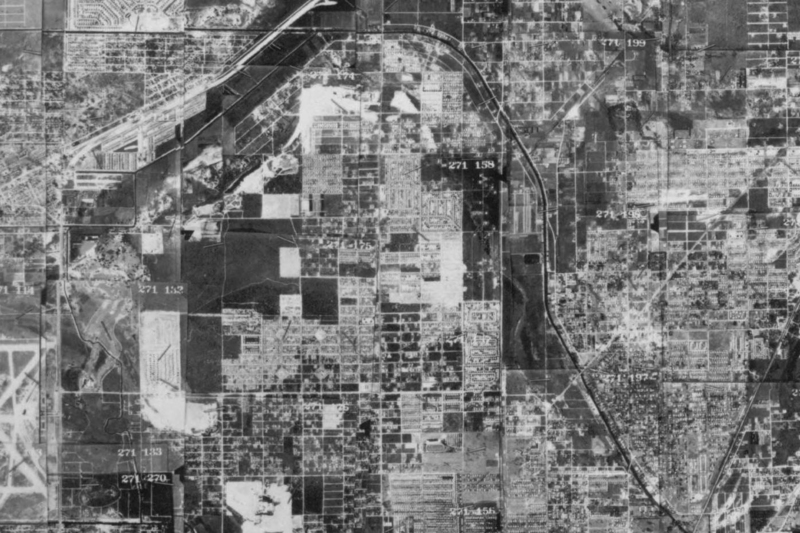 Almost convinced, I searched the aerial photography of Florida collections at the University of Florida Digital Collections and found several index images which included my area of interest. I was unable to find any imagery taken earlier than 1940; however, even the 1940 photograph confirmed my hunch. 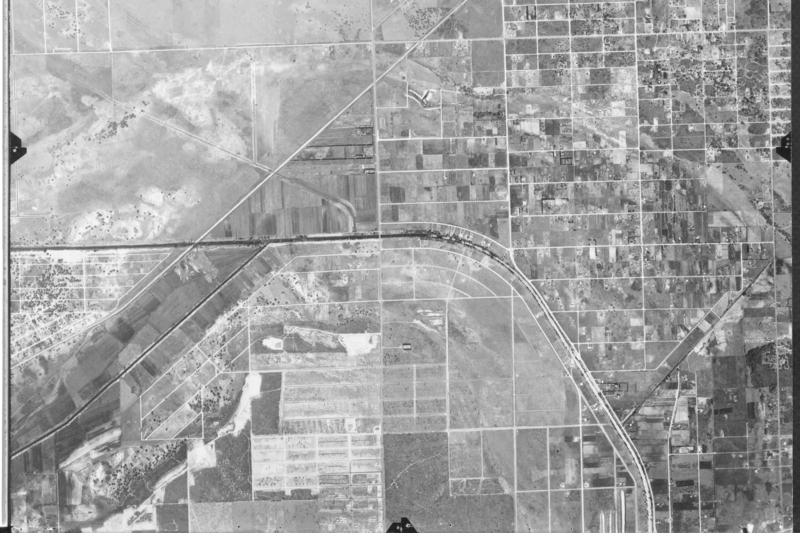 In this image the land north and west of (what would become) Barry University and Gratigny Road there appears to a partially isolated stand of pines. This location matches Young’s comments to Huber and Knisley; Gratigny Road runs through these pines which extend into what would become Barry University. But, even in the six years after Young collected the type series of C. floridana there appear to have been significant new development visible (including Barry University, founded in 1940) and the areas east and southeast of the canal are already heavily built up. 30 May 1972, visited the intersection of Miami Ave and Gratigny Rd (=119th St). Frank Young said that he had taken floridana in the NE corner of that intersection. 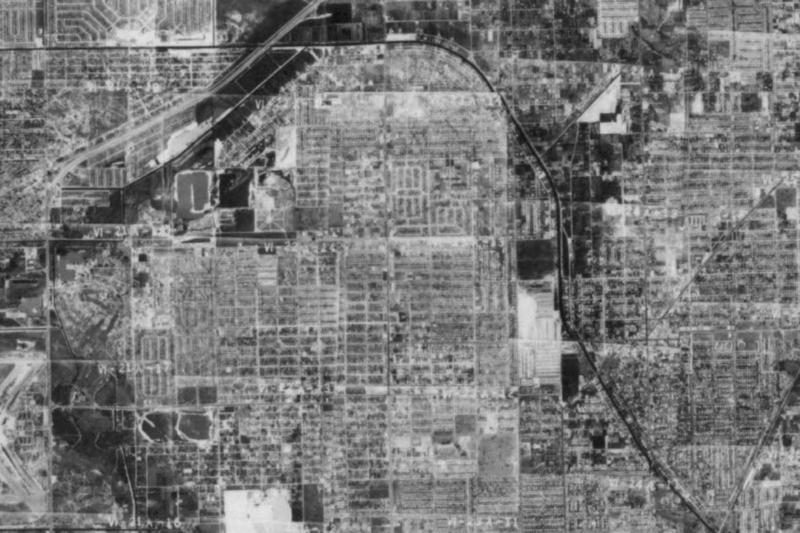 The next image (showing the area just north of Gratigny St.) is from 1947 and the pines appear to have been largely cut down and the area has been divided up into parcels. I find it unlikely that C. floridana would have occurred at the type locality in 1947, though perhaps to the west where there appear to still be some pines standing. 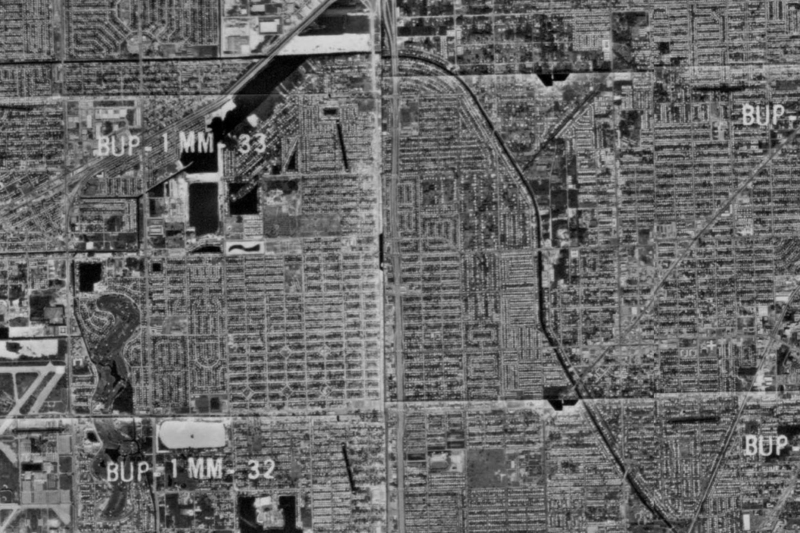 The development dramatically increases in 1949-50 and the whole area is largely housing by 1950. Any rocklands habitat that remained after this time was certainly too fragmented and poor quality to sustain a population of C. floridana. Brzoska, D., C.B. Knisley, and J. Slotten. 2011. 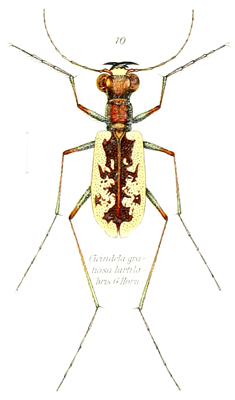 Rediscovery of Cicindela scabrosa floridana Cartwright and its elevation to species level. Insect Mundi 2011 162:1-7. Young, F. N. 1951. Vanishing and extinct colonies of tree snails, Liguus fasciatus, in the vicinity of Miami, Florida. Occasional Papers of the Museum of Zoology, University of Michigan. 531: 21 p.
It is an early August morning and I am sitting in the Richmond International Airport, once again waiting for a flight to south Florida. There I will be revisiting the site where Cicindelidia floridana, once believed extinct, was rediscovered in 2007. Last August I had the privilege of seeing this rare species in the wild and photographing several individuals while assisting Barry Knisley with surveys of the potential habitat. Ever since that trip to Miami I hoped to make another trip down to see this species so when Ted MacRae, author of the excellent blog Beetles in the Bush, mentioned he was traveling to Florida this summer I jumped at the chance to see this species and to meet Ted in person. Before long the arrangements were set; not only would I be meeting Ted, but also the co-author of the floridana paper and prolific tiger beetle collector David Brzoska. We would not be meeting until the evening of the day after my flight arrived, so upon my arrival in south Florida, while I had some free time, I visited several sites in search of a number of Floridian tiger beetle species (the results of this tangent will be detailed in future posts). We got an early start the next morning and headed out from Naples towards Miami on the approximately 2½-hour drive. By the time we reached the site the temperature was climbing through high eighties, presenting a distinct challenge to photographing this specie let alone any tiger beetle. C. floridana is found in open sandy patches in pine rocklands, a habitat once common in the Miami area. The saw palmetto obscured any sandy areas so from a distance the habitat seemed unsuitable. As Ted and I readied our camera gear, Dave ventured out through the saw palmetto and soon called out that he had spotted a beetle. I walked to a nearby sandy patch and quickly noticed the distinctive flash of movement. This first beetle darted away and then took flight as I attempted to maneuver closer. However, in the next sandy area I spotted another beetle and began to slowly move in. This beetle also turned and took flight. And the next. This frustrating sequence of events repeated several times. At last, after painstakingly inching forward on my stomach, I finally snapped a beautiful shot of a small male beetle. From a distance the beetle’s color was an oily bronze with subtle green undertones, but up close and lit by my flash this striking green was fully visible. While I snapped off several shots this cooperative beetle remained still and, pressing my luck I moved in for a closer shot. To my surprise I was able to zoom in and get a closer shot which prominently showed the snow-white pronotal setae. After this definite success, I managed to snap shots of a few other beetles, but none of these images turned out quite as nice as my first shots. I then observed the behavior of the beetles in a few of the clearings. With the sun out and the temperature well into the eighties the beetles were actively moving about the sandy areas. I would notice a beetle occasionally “duck” its head as it snatched up one of the many small ants that were also running about. The beetle in question would then stand still and, watching closely, I could make out the swift movement of its mandibles as the hapless ant was reduced to mush. When not actively looking for prey or a mate, the beetles would often take refuge from the sun in the shade of a grass stem near the edges of the clearing. I did see several attempted matings while I watched and once particularly determined male did manage to maintain his grip. The pair remained coupled for several long minutes until the female dislodged the male and scurried away. Time passed all too quickly and before long Ted, Dave, and I began to gather back up to the car and soon headed back down the road to Naples. It had been a extremely successful day for me and Ted as well. Check out Ted’s excellent post on this trip here or check out the photos from my first trip to see this species here.